While web applications and mobile apps are the common channels for user interaction, they are not the only ones. 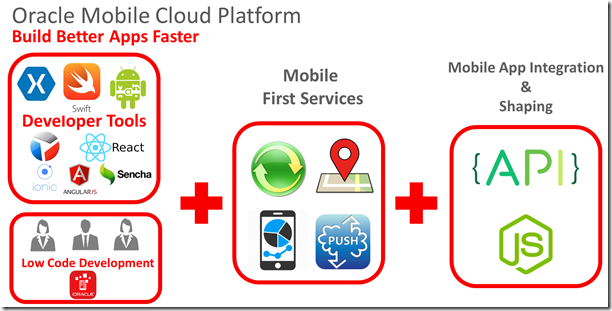 Oracle is recognizing that fact and as a result MCS (Mobile Cloud Service) is undergoing some changes that may earn it a new name: Multi Channel Service. MCS – launched in the Summer of 2015 – already supports incoming HTTP and HTTPS and outgoing push notifications to Apple, Microsoft and Google. 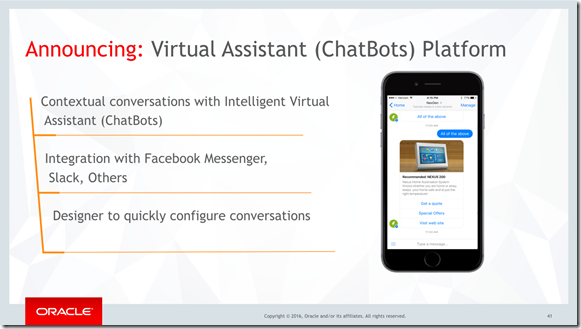 It is adding SMS, WhatsApp, Facebook Messenger and Slack as channels through the Virtual Assistant, a ChatBot platform. 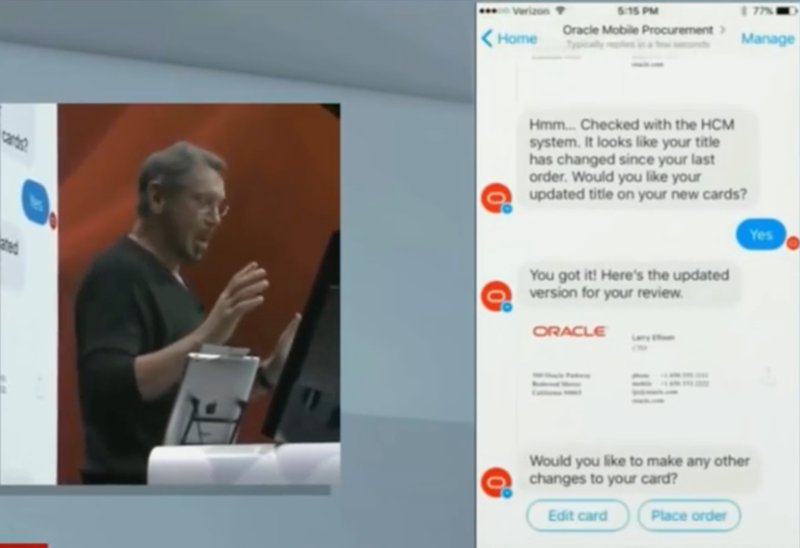 Oracle has indicated that more channels will be supported in the near future. Speech to text conversion enriched with natural language processing could perhaps be one of them for telephone or VOIP based voice response systems. I have reused the next figure from a presentation at OOW 2016 by Andrejus Baranovskis. 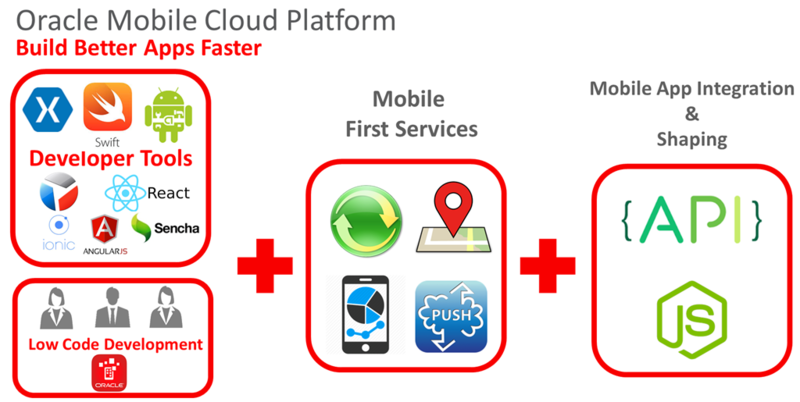 It shows very nicely how a mobile app experience can be implemented using various technologies in Oracle’s portfolio. Note how in this figure the back end services are on the left and the mobile app is on the right. The use of ADF BC REST is optional – alternatives are for example ICS, ORDS, straight JAX-RS (plus JDBC), Node.js (plus Oracle Database driver for Node). Also the choice for the technologies used for building the mobile app is free – as the first figure in this article already indicated. The Virtual Assistant “ChatBot” platform will enable MCS to engage in conversations across chat channels: SMS, WhatsApp, Facebook Messenger and Slack. This includes authentication of the incoming user, following preconfigured conversation flows that also involve interaction with enterprise back ends – through the APIs published on MCS – and contain conditional logic. The platform can also include images, file attachments and simple forms in the chat dialog. When the APIs invoked by the ChatBot have been implemented using predictive analytics and machine learning, the dialog may appear smart and include recommendations, proactive responses and relevant warnings. Designing a ChatBot conversation is a declarative and visual, browser based process that seems very straightforward. (Larry Ellison demonstrated this chat conversation editor in his keynote session during Oracle OpenWorld 2016). 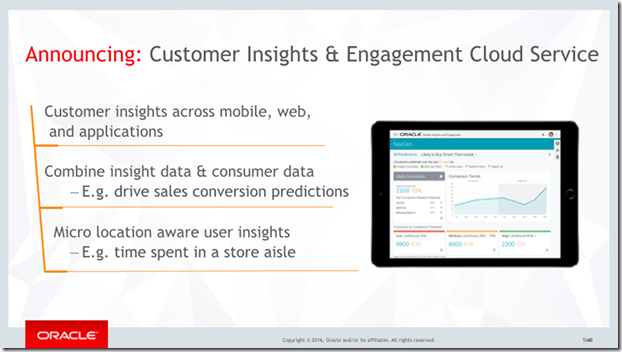 The Customer Insights & Engagement Cloud Service (CIECS) is introduced to help organizations to get cross channel insight in the activity of their users (“Help you gain the Traction you need across your enterprise’s Digital efforts”). Web applications, mobile apps and other user interaction channels can send messages to CIECS describing a user activity – along with the user’s identity and (GPS or beacon derived ) micro location (when available). A typical example would be to send a message for each step in a workflow in an application or a web shop. Apparently, MCS is configured to automatically send analytics data to CIECS – for customers who subscribe to both services. Custom analytics reporting to CIECS consist of making simple REST API calls. CIECS links together all messages for the same session and the same user. It can relate these data to other information about the user – for example from Marketing, CRM or Sales systems – and use the data available for all customers to predict the behavior of individual customers. All metrics gathered by the CIECS can be used to analyze the effectiveness of the interaction channels with respect to various user attributes. 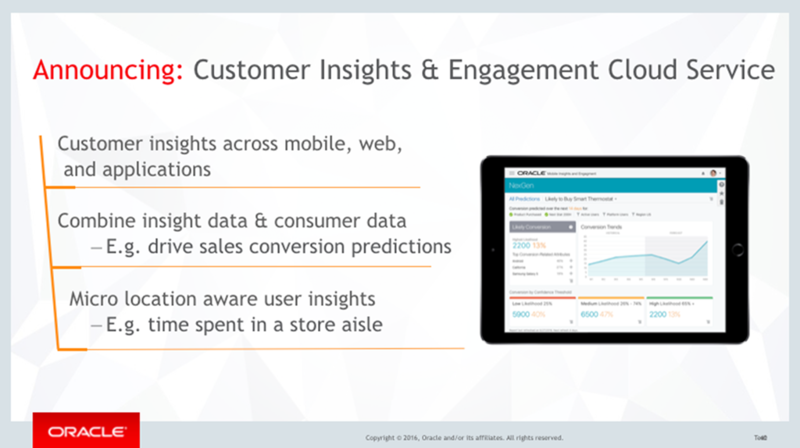 It also supports a micro-targeting approach, focusing on specific locations and/or customer characteristics. Part of the MCS product is MAX, the Mobile Application Accelerator. Like ABCS (Application Builder Cloud Service), MAX offers a rich, visual, declarative and code free application assembly experience, resulting in a mobile application. To build a mobile app, you don’t have to download platform-specific development tools like Android Studio or Xcode. And you don’t have to worry about configuring device simulators, either. With MAX, you’re not even tied to a development machine. Because it’s a web-based tool, you can log in from any computer or tablet and immediately begin building, testing and deploying your app. At the time of writing: MAX has a different application designer than ABCS, even though the objective of ABCS and MAX is very similar. The technology of the mobile app produced by MAX is at this moment MAF – the Mobile Application Framework. JET is the technology in ABCS. 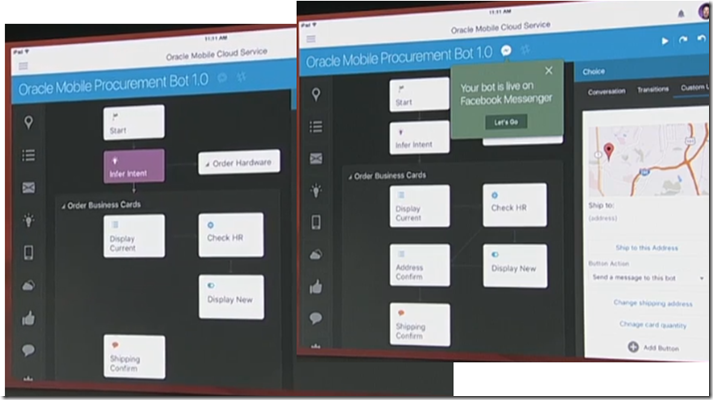 The message from Oracle is that ABCS and MAX will merge together – to provide a single citizen developer’s user interface for composing applications – and that both will produce JET applications – either published as hybrid mobile app or hosted on the cloud as web application.